This is a selection of the London walks I have done for groups. Some walks include guided visits inside historic buildings or Museums such as British Museum, Somerset House and Tate Britain for no extra charge. Others include or could be combined with a guided tour of major sites such as Westminster Abbey, St Paul's Cathedral, Southwark Cathedral or Tower of London where the entry fee is not included. The normal charge is the minimum Blue Badge rate of �145 for a half day or �249 for a full day. I can offer discounts in some cases, eg. for charities, student groups or families. Please contact me by EMAIL or phone (see bottom of page) to discuss any particular requirements as I like to tailor walks to the interests of the group. I could also do tours of many other London areas if required. Explore ancient alleyways and churchyards where Roman and medieval remains hide behind exciting modern buildings. We see a remarkable variety of architecture, including the glorious baroque St Paul's Cathedral, the medieval Gothic Guildhall, the 18C Mansion House and new structures by Norman Foster and Richard Rogers. The many Livery Halls and churches, including romantic church ruins, will enhance your enjoyment of London's City in a way only possible on foot. 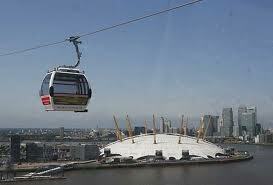 We start at the O2 Dome from where we embark on the Thames Cable Car, London's latest river crossing. This rises to a height of 90 metres with stunning views over the Thames, the Royal Docks and East London. Arriving at the Royal Victoria Docks, we take the Docklands Light Railway to North Woolwich. Here we embark on the Woolwich Free Ferry and end up amidst the historic buildings in the former Woolwich Arsenal. We explore the Queen Elizabeth Olympic Park, which is being transformed from the 2012 Games into a public park. 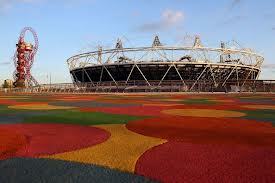 You will find out about the history of the site and the 2012 Olympics, and see the stadiums and buildings in the park. We return to the Naughty Nineties as Oscar Wilde mocks the twilight of the Victorian era. See the theatres, clubs, caf�s etc. where his wit triumphed. Follow the events leading to his trials and final imprisonment. Expect the unexpected in the back streets of Mayfair and St James, including a 16th Century Tudor cowshed! Explore the peaceful Inns of Court to hear the history of the Barristers and their customs. Visit their ancient Elizabethan hall (when open) and learn about the literary figures connected with the Inns from Shakespeare to Dickens and 'Rumpole of the Bailey'. View the 12th century Church of the Knights Templar and see the garden where the Wars of the Roses were said to have started. We end up with a visit inside the Royal Courts of Justice. Explore the streets leading up to the Strand and enter Covent Garden via a hidden courtyard. Learn about the actors, authors and artists who lived here. Stand where Eliza Doolittle sold her flowers and hear the history of the market and theatres. Follow in the footsteps of Dickens through the heart of the City in the company of Mr Pickwick, Ebenezer Scrooge and friends. Explore ancient alleyways, churchyards and an underground prison. See the medieval Guildhall and finish in a traditional Victorian marketplace. We will explore the South Bank of the Thames between London Bridge and Shad Thames. The views are stunning especially if the tide is out and we can descend on to the pebbled banks almost directly under Tower Bridge. We will find out where Dickens' villain Bill Sykes died and how the old warehouses and docks have been transformed into exciting residential and leisure usage. Finally we will walk across Tower Bridge and visit St Katherine's Dock with its collection of historic ships. Follow the footsteps of Wat Tyler, William Wallace, Marx and Lenin. We see three of London's ancient monasteries including a visit inside London's oldest hospital and monastic church as we hear about the hangings of monks and martyrs. This unusual walk ends up at the Old Bailey, site of the notorious Newgate Prison and scene of famous trials such as that of Oscar Wilde. The gallows nearby were used for public hangings until late in the 19th century! We can continue our reminiscences in the adjacent pub. Trace the history of this fascinating area of Thames waterfront. Discover its sinister past from Execution Dock to the opium dens of Limehouse. Enjoy spectacular riverside views, walk down cobbled streets lined with 19th century warehouses converted into exclusive apartments and hear about the time when these streets were bustling with activity during the heydays of the docks. Finally there is the Prospect of Whitby - London's oldest pub. Follow the footsteps of Chaucer's pilgrims and William Shakespeare to the ancient entertainment district of the City. Visit a 17th Century galleried Inn near where the Canterbury Tales began. Discover the sites and remains of ancient prisons, brothels, Elizabethan theatres and the famous medieval inhabited London Bridge. We end up by the Globe Theatre and the newly opened Tate Modern on Bankside. Both provide refreshments and are well worth visiting. The Bloomsbury set were described as 'people who lived in squares and loved in triangles'. Stroll through the Georgian Squares of Bloomsbury and Fitzrovia to see the homes where writers lived, worked and loved. 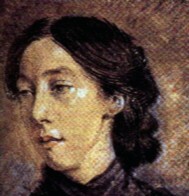 Virginia Woolf, George Bernard Shaw, Dylan Thomas and friends request the pleasure of your company. London has undergone a remarkable transformation over recent years. Iconic new buildings by famous architects have arisen amidst historic city alleyways and more are in process of construction or planned. On this tour you will walk around the exciting modern Broadgate development and the accomanying restoration of Liverpool Street station. 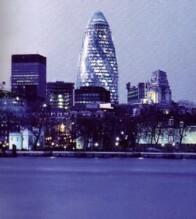 We then see several new buildings including Norman Foster's Gherkin and Richard Rogers's Lloyd's Building. and learn about future plans for the city.